There are periods in history where the interpretation of exactly one period depends on several evaluations, which caused by no concrete knowledge must be a question of an assumed probability. The Viking period and the early Middle Ages are such periods. There are many sources and chronicles to look into, but most of the material was written a hundred years or more after the events. So what is the absolute truth about the periods and the persons we really want to know just a little more about? This will always be a mystery - and maybe that's why it is so fascinating, it's like working on a crime story. 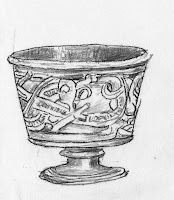 Silver cup from Gorm's burial chamber. Jelling kirke, a pretty silverband across Gorm's grave in the choir. The Danish kingdom existed a long time before Gorm. According to the Nordic sagas Gorm's father was Hardeknud (Knud I Hardegon), who was king before Gorm, but Gorm is the first Danish king since 873, who is more than a name to us. Gorm was supposedly a descendant of Sven, whose son came from Nortmannia and drove away his rival. The runestones in Jelling confirm that Harald was his son and successor and that Gorm's wife was Tyre. The monuments and the inscriptions at this place tell us that Jelling was an important power center. Gorm was first buried in the large Jellinghill, but after Harald's christening his body was moved and buried under the floor in the middle of the wooden church, Harald built. The wooden burial chamber in the large hill has been excavated, and the dendrochronology proves that Gorm's death must have been in the winter 958. Most of Gorm's skeleton was found in a chamber grave in the church in 1978 and sent to the National Museum for further examinations. They showed that he had been ab. 172 cm tall and not heavily built. He was ca. 40-50 years of age and "like most other middle-aged Danes he suffered from osteoarthritis in the bottom section of the spinal column. In year 2000 Gorm was re-buried in Jelling kirke in a metal coffin placed in a concrete chamber under the floor in front of the choir. 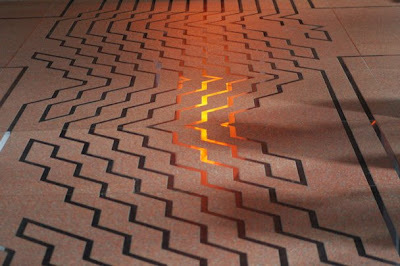 The church floor is here decorated with a silver band. The memorial stone Gorm raised for Thyra describes her as "tanmarkar but", "Danmark's Bod", = "Danmarks pryd" = The pride or the jewel of Denmark. There have been many interpretations. The Danish word pryd means an ornament = a jewel = a beautiful woman. Maybe this is what Gorm meant. after Thyra wife his Denmark's pride. This is the first time the name Danmark is mentioned in Denmark, but it was known in Europe at least 75 years before in king Alfred the Great's geography-book, where the word "dene mearc" is used for the Danish area. Thyra's burial place is not known, but maybe she was buried in the mighty stone ship, which was where the church and the hills are now. There is hardly any hope of finding her grave. If it was placed in the middle of the area, it might be in the present church yard, but many graves have since removed every trace of earlier burial places. Gorm calls himself king on the small rune stone, so it must have been raised after he became king in ca. 934 and before his death in 958. Thyra's year of death is not known, but she died before 958, and this means that she probably was born ab. 900. Gorm and Thyra had a son Knud Dana-Ast, who was killed on an expedition to England ca. 940 and the son Harald, who became king of Denmark. Furthermore a daughter *Gunhild, who was married to Erik Blood-Axe. Toke Gormsen, who possibly/probably was Gorm's son, might have had another mother. * The earliest saga Historia Norwegiæ describes Gunhild as a daughter of Gorm den Gamle, king of Denmark ( and thus a sister of Harald Blåtand). Most reports call her father Ozur, with the byname Toti "teat" (Egils saga Fagrskinna, Heimskringla), or lafskegg = hanging beard (Agrip, Fagrskinna) a man from the northern province Hålogaland. (Egils sagas, Heimskringla). Icelandic hostility towards Gunhild has been cited as a possible cause for her distinction from the Danish royal house. Gorm married Thyra,who is given conflicting and chronologically uncertain parents in later sources. Saxo Grammaticus og Svend Aggesen wrote in the 1200s about the wise, beautiful and virtuous queen, and how she built Danevirke; she might have supervised an extension of the bank for some reason. Danevirke was built much earlier, which has been proved by dendrochronology. The history says that the German emperor Otto I courted Thyra, which indicates that she must have been the daughter of a wellknown king. It was said later on that she was a devouted Christian and thus an example for her son Harald. But from where came Thyra? She was unlikely a Jutlander. Danish kings almost always chose wives from other countries than their own. Harald and his son married Slavic princesses and Knud den Store's wife Emma was from Normandy. Thyra came without any doubt from nobility and was probably the daughter of a ruler. Although Saxo gave some wrong informations about the details, he attached importance to that "Tyre came from a foreign country" and that her person was of crucial importance to Harald's inheritance. According to Saxo Harald was the first Dane to inherit the Danish throne, and he inherited it from his mother Tyre. a) she was a daughter of the Jutland earl Harald, who was a grandson of king Harald Klak. b) she was a daughter of king Ethelred I. of England, which cannot be true since he died in 871.
c) she was a daughter of king Edward the Elder of West Saxon, which holds more probability at least according to age; he died in 924, and since there are sayings that she was related to king Alfred the Great, he would then be her grandfather. Or she might be the daughter of a ruler from East Denmark, which was not yet a part of the Danish kingdom - and which therefore might be considered a foreign country. This fits in with that Harald was dependent on her inheritance in order to inherit the whole kingdom. Kilde: Dansk/Norsk/Svensk Biografisk Lexicon; Danmarks Historie, Politiken 3-4; Vikingeskibsmuseet; Nationalmuseet; Skalk, arkæologisk magasin; Saxo Grammaticus; Emma emmorium; Sejer Olesen Leth og hans slægt af P. Filtenborg; Den Hvide Klan af Michael Kræmmer; Thi de var af stor slægt af Marianne Johannesen & Helle Halding. Adam af Bremen says that Gorm's father Hardeknud came from Northmania to Denmark and ousted the young king Sigtrygg Gnupasson, and when Hardeknud died Gorm took over the throne. Other sources say that Chnuba (usually identified as Gnupa, Sigtrygg's father) still ruled in 934, while Heimskringla reports that Gnupa was conquered by Gorm den Gamle, again placing his death later than Adam wanted it. Adam mentions that there were several kings at that time and expresses his doubt that Denmark represented a united kingdom. Arild Huitfeldts Danmarks Riges Krønike tells how Gorm died. Gorm preferred the eldest son, Knud Dana-Ast, and he swore an oath that the messenger who brought him the news about Knud's death would be executed. The two sons, Knud and Harald, were true vikings, they left Denmark each summer on viking expeditions. Harald returned to the royal residence at Jelling with the news that Knud had been killed in an attempt to conquer Dublin in Ireland. He was shot with a coward's arrow, while he was watching some games in the evening. No one wanted to tell the king this, considering the oath he had sworn. Queen Thyra ordered to hang a black cloth up in the royal hall and that no one said a word. When Gorm entered the hall, he grew astonished and asked what this black mourning colour meant. Queen Thyra said:" My lord king, you owned two falcons, a white and a grey. The white flew far away and was attacked by other birds, who tore off its beautiful feathers, and it is now of no use to you." - "My son must have died, since all Denmark is mourning!" - "You said that my lord king and not I" said Thyra. "But what you said is the truth." According to the legend Gorm was so struck with sorrow that he died the following day. Gorm was old in that sense that he was always considered the traditional ancestor of the Danish monarchy, the oldest in Europe. It was a tradition/ habit to give bynames to persons, since a last name was not used until the middle of the 1800s in Denmark. The by-name was in several categories: based upon an event, on physical marks, on a pun, or based upon the opposite of the person's character = a witty byname. Den Store Danske, Gyldendals åbne enkyklopædi: Gorm den Gamle, died probably 958, Danish king. Gorm belonged to the Jelling dynasty, which according to Adam of Bremen came from "Nortmannia", = Norway or Normandy, and after 900 took the power from the dynasty which shortly before 900 came from Sweden. Gorm is mentioned for the first time in 936 when he gave archbishop Unni of Hamburg-Bremen a cool reception. He probably died in 958, this year a 40-50 year old male was buried in the northern hill in Jelling, and his bones were later re-buried in the first wooden church in Jelling. This man was probably Gorm, who must have been born between 908 and 918. According to the inscription on the small Jelling stone he was married to Thyra, and upon the large Jelling stone he is remembered as Harald I Blåtand's father. 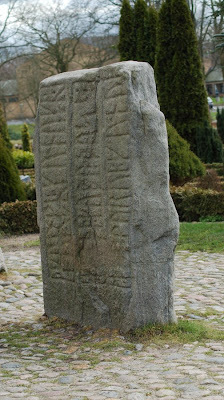 It is possible that Gorm's kingdom only was Jutland, but not certain, since it is not precisely known, what it means that Harald Blåtand "vandt sig al Danmark" (won himself all Denmark) as is written on the large Jelling stone. Here is an essence of a very interesting article by Magnus Brandt Tingstrøm in the magasine Videnskab.dk: "Would nowadays Danes be able to talk to Gorm the Old, if he came to their doorstep?" an interested reader asked this question, he had discussed the matter with some friends and now sought advise by: Spørg Videnskaben. (Ask Science).The question was sent to an expert, lektor and ph.d. Hans Götzsche for lingvistik at Ålborg University. Hans Götzsche points out that there would be no probability that a common Dane would be able to understand Gorm the Old. He explains that the Danish spoken language has changed radically since the time of the old Vikings. About 1000 years ago Danish could be said to be just one dialect of the common Nordic language, which was spoken in all of the North. Since then there have been great changes of the language in grammar, vocabulary and pronunciation. Hans Götzsche says that the largest change happened from ab. 1000-1500. Gorm the Old spoke almost like Icelanders today, and they are not understandable to a Dane just like that. Interesting! Thanks for posting. I've heard the term "Danebod" in reference to a church and family camp but never heard about the word's origin and meaning.